Bring home a little bit of the Mediterranean with our Greek-Style Pasta Salad recipe. 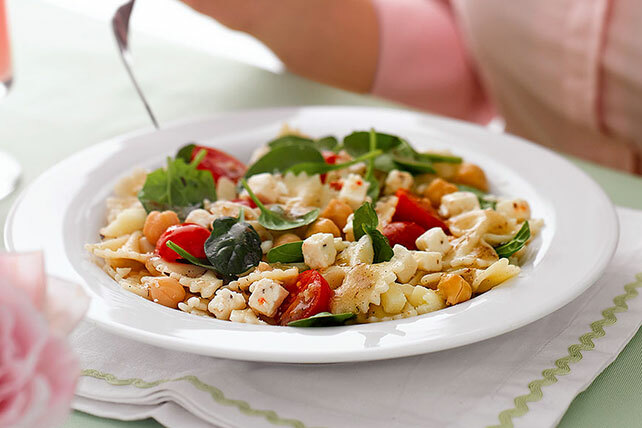 With spinach, feta, cherry tomatoes, chickpeas and a zesty vinaigrette, Greek-Style Pasta Salad has all the Greek island flavor you'd expect. Plus, Greek-Style Pasta Salad only takes 20 minutes to make! GOYA is a registered trademark of Goya Foods, Inc.
Cook pasta as directed on package, omitting salt; drain. Place pasta in large bowl. Add remaining ingredients; mix lightly. This simple, yet flavorful, salad can be prepared ahead of time. Refrigerate up to 3 hours before serving. Mix 1/2 cup KRAFT Zesty Italian Dressing, 2 Tbsp. lemon juice and 1 tsp. dried oregano leaves until blended; use instead of the vinaigrette dressing.